« Robots: what do they mean for jobs and incomes? 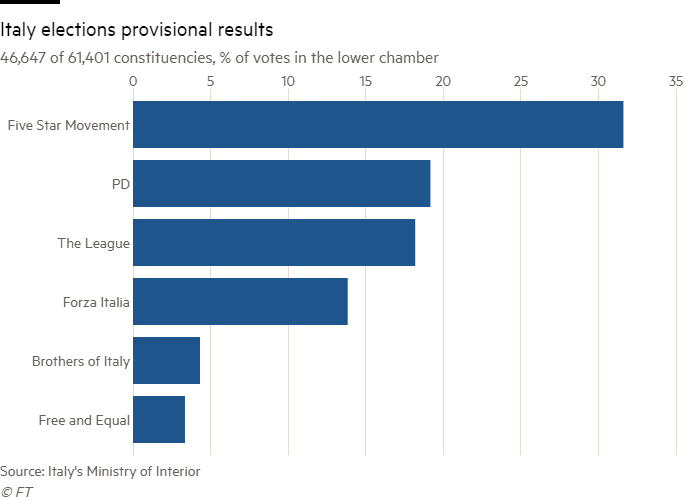 The winners in the Italian general election held on Sunday were the so-called ‘populist’ parties. The Five Star party founded by ex-TV comedian Beppo Grillo and now led by Luigi Di Maio, took over 30% of the vote and will be the largest single party in the new parliament. It presented itself as an anti-establishment, anti-corruption party. Previously it had called for a referendum to leave the EU but recently dropped that and switched to social policies. In the election, it proposed a Universal Basic Income (UBI) for all, which won it many votes from the young unemployed and poor, particularly in the south. The other winner was the Northern League, which, as it name implies, used to be a separatist party campaigning for autonomy of the richer northern parts of Italy and calling for an end government transfers to the poor and ‘lazy’ south. But under its new leader, Matteo Silvini, it has become an anti-immigrant and anti-EU party like the National Front in France or UKIP in Britain. This led to a sharp increase in its vote share, to around 18%. Italy now has the highest proportion of anti-EU opinion in the Eurozone (although that’s still a minority view). The losers in the election were the traditional mainstream centre-left and centre-right parties. The incumbent centre-left Democrat party was humiliated in the vote. A product of a merger between the Communists and the Socialists in the 1990s, it had steadily moved to the right to become a pro-capitalist ‘Blairite’ party. Its vote share under Matteo Renzi, the former prime minister, fell to under 20%, half its share just five years ago. The centre-right party, Forza Italia, is a creature of media billionaire and former PM, Silvio Berlusconi. It was expected to do better in the election but eventually it polled just 13%, way less than its electoral coalition partner, the Northern League. The other winner was the ‘no vote’ party. The rise in the number of those not voting at all has been a feature of elections in the major capitalist economies in the neoliberal period and in this Long Depression. 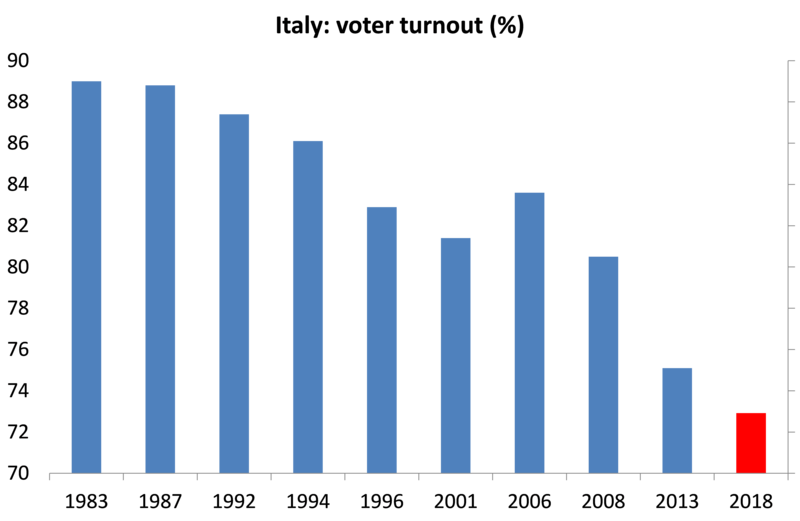 Since Italy abolished compulsory voting in 1993, voter turnout has steadily fallen. In this election it reached a new low. The no vote ‘party’ polled 28% (if still relatively low by the standards of voter turnout in the US or the UK). None of the parties or electoral coalitions have enough seats to form a governing majority in parliament, so what now? It seems to me that there are three possibilities. The first is that, despite losing the election, the centre-right and centre-left will form a coalition, possibly with the Northern League. Such coalition has been the solution in Germany where last September’s election led to a similar decline in the two mainstream parties. It would be what Italian and European capital would prefer. But such a coalition will be difficult to sustain given that the Northern League has polled better than Forza Italia in their coalition and the Democrats have been crushed. The second possibility is the worst for Italian capital, namely that Five Star and the Northern League form a government. That would mean breaking from austerity policies on public finances, possible attacks on big business interests and increased demands for withdrawal from the Eurozone. But this again is unlikely because the Northern League would not want to be a junior partner in a coalition with a party that gets its main support from the poor south. The third possibility, assuming that Five Star sticks to its refusal to form any coalition, is that the Italian president appoints a temporary ‘technocratic’ government for say six months and calls another election in September. It’s a political mess. But that political mess mirrors the mess that is the Italian economy. The Eurozone economy has enjoyed a modest revival in the last 18 months and the area as a whole is now growing faster even than the US and the UK. But Italy is not. It is still a member of top G7 advanced capitalist economies, but its working population is falling, despite an influx of immigrants in recent years, and the productivity of the workforce is stagnating. Unemployment remains high compared to other EU economies. Combine low employment growth with low productivity growth of that labour force and the Italian economy has a low long-term potential growth rate of no more than 1% a year. Productivity growth is stagnating because Italian capital is not investing productively enough. And why is that? Because profitability is low. The profitability of Italian capital reached an all-time low back in the early 1980s, like most other major capitalist economies. 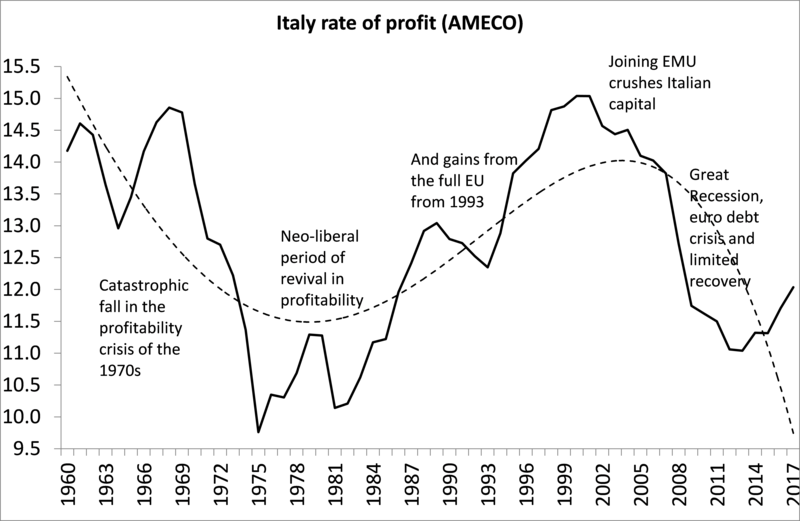 During the neo-liberal period, profitability rose significantly and with the start of the full European Union, Italian profitability returned to the highs of the 1960s. But joining the Eurozone saw a sharp turn downwards. Italian businesses were now exposed directly by Franco-German capital. Italy has a high proportion of small to medium size companies with particular markets and these were now in trouble. The Great Recession and the ensuing Long Depression compounded that weakness and many Italian companies ran up huge debts with banks that they increasingly could not pay. Italy’s banks started to go bust and, despite recent government bailouts, Italy’s banks still have more ‘bad debts’ on their books than the rest of the Eurozone put together. The current upswing in Eurozone economies may help to keep the Italian economy’s head just above the water, but with per capita income is falling and unemployment is still high. Public debt to GDP is the highest in Europe after Greece and the corporate debt overhang still huge. So any new global slump is going to put Italian capital back into deep trouble. The current political paralysis shows that the politicians have as yet no solutions. With the Ides of March approaching. This entry was posted on March 5, 2018 at 2:05 pm and is filed under capitalism, economics, Profitability. You can follow any responses to this entry through the RSS 2.0 feed. You can leave a response, or trackback from your own site. Great article! Have you considered writing something about Sweden? It’s election year there as well. Thank you Michael. Very useful. You should consider writing more on what Italy can do to get moving any why it is so stuck like you did for Greece, analyzing its history and how oligarchs and services were keeping them uncompetitive and limiting their growth potential even as wages and rents collapsed. This would be huge if there are new election and a good economic perspective would be valuable to see in the forign press like Jacobin. Sorry, but i think this place belongs to South Korea. But i’m talking about industrial productivity, educational level, investment in science and technology, number of patents, etc. Yes – so Italy is a large capitalist economy that is relatively failing – exactly. Korea is not bigger but better. Yup but when China tried to build a large jetliner, one generation behind the latest western versions it had to use western components and engines to enable it to fly. Michael, what is the germany´s interest in keep a European Union with failed states like Spain, Greece and Italy?? Michael Roberts, where can i find that study saying that the world elite is composed of 12% of :USA´s population?